Wow, I'm tired! Michelle and I went running again today in the middle of the day. We will definitely be sticking to mornings when it's cooler now, that was just torture! And I got home and realized we'd been running the wrong times. The program we are using to train has you start out jogging 60 seconds and walking 90 seconds, for 20 minutes. I had the times mixed up so we were jogging 90 and walking 60. No wonder it was so hard! So Saturday should be much easier since we are going in the morning and will run the right times! Today I am thankful that it's a beautiful day and we are going to the zoo with Michelle. Toddler is going to love it I'm sure. He loves animals. So we will spend a few hours there and have lunch. Then later Michelle and I are going to run again. So I'm just thankful for such a beautiful day and that I'm in a good mood. Things are going pretty good with the potty training. We bought Toddler some Cars underwear, but he's not used to them and usually pees in them, so mostly we still let him run around bare. He hardly ever goes in a diaper when we have it on him. He tells us when he needs to go potty and only occasionally has an oops on the floor. We even went out of town Saturday and he used his potty all day even though he had a diaper on just in case. He also used the big potty at Michelle's house yesterday, which was a first. So things are going pretty well! I'm not going as far as saying he's trained yet, but it's a good start. Hopefully within a few more weeks he'll be fully trained. I'm doing another MEME I got from Dawn :) Join in if you want! I found this cool little meme on Lorie's blog. Every Tuesday you post 10 things about the topic or question. Go here to check it out. This week's is your greatest accomplishments. Anyone can join in so have fun! I was never really taught much about Memorial Day, how it began, what it means, etc. My family never really celebrated it in any way. Here is a history of how it began and what it stands for. Remember to take some time today to remember our deceased loved ones, but especially all those who have died in service to our country. Memorial Day, originally called Decoration Day, is a day of remembrance for those who have died in our nation's service. There are many stories as to its actual beginnings, with over two dozen cities and towns laying claim to being the birthplace of Memorial Day. There is also evidence that organized women's groups in the South were decorating graves before the end of the Civil War: a hymn published in 1867, "Kneel Where Our Loves are Sleeping" by Nella L. Sweet carried the dedication "To The Ladies of the South who are Decorating the Graves of the Confederate Dead". While Waterloo N.Y. was officially declared the birthplace of Memorial Day by President Lyndon Johnson in May 1966, it's difficult to prove conclusively the origins of the day. It is more likely that it had many separate beginnings; each of those towns and every planned or spontaneous gathering of people to honor the war dead in the 1860's tapped into the general human need to honor our dead, each contributed honorably to the growing movement that culminated in Gen Logan giving his official proclamation in 1868. It is not important who was the very first, what is important is that Memorial Day was established. Memorial Day is not about division. It is about reconciliation; it is about coming together to honor those who gave their all. She then conceived of an idea to wear red poppies on Memorial day in honor of those who died serving the nation during war. She was the first to wear one, and sold poppies to her friends and co-workers with the money going to benefit servicemen in need. Later a Madam Guerin from France was visiting the United States and learned of this new custom started by Ms.Michael and when she returned to France, made artificial red poppies to raise money for war orphaned children and widowed women. This tradition spread to other countries. In 1921, the Franco-American Children's League sold poppies nationally to benefit war orphans of France and Belgium. The League disbanded a year later and Madam Guerin approached the VFW for help. Shortly before Memorial Day in 1922 the VFW became the first veterans' organization to nationally sell poppies. Two years later their "Buddy" Poppy program was selling artificial poppies made by disabled veterans. In 1948 the US Post Office honored Ms Michael for her role in founding the National Poppy movement by issuing a red 3 cent postage stamp with her likeness on it. There are a few notable exceptions. 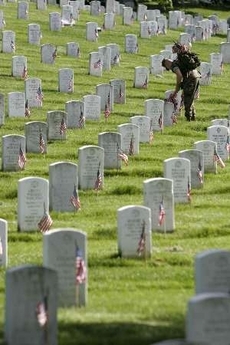 Since the late 50's on the Thursday before Memorial Day, the 1,200 soldiers of the 3d U.S. Infantry place small American flags at each of the more than 260,000 gravestones at Arlington National Cemetery. They then patrol 24 hours a day during the weekend to ensure that each flag remains standing. In 1951, the Boy Scouts and Cub Scouts of St. Louis began placing flags on the 150,000 graves at Jefferson Barracks National Cemetery as an annual Good Turn, a practice that continues to this day. More recently, beginning in 1998, on the Saturday before the observed day for Memorial Day, the Boys Scouts and Girl Scouts place a candle at each of approximately 15,300 grave sites of soldiers buried at Fredericksburg and Spotsylvania National Military Park on Marye's Heights (the Luminaria Program). And in 2004, Washington D.C. held its first Memorial Day parade in over 60 years. Homer: "If I could just say a few words, I would be a better public speaker." Thought this was funny, gotta love the Simpsons. I hate public speaking and avoid it at all costs. I just never know what to say and I get horrible stage fright talking in front of people. I hate having to give talks or presentations, even the thought makes me sweaty and nervous. Does anyone here actually like public speaking? Being late runs in Hubby's family. If they say they will be somewhere at a certain time I mentally prepare for them to be at least an hour late, and I'm usually right lol. I don't really mind them being late cuz I'm used to it now, I just tell them to be here an hour earlier than they need to be and it works out great lol. But Hubby also carries the trait, and I HATE being late. Or leaving rate, running late, being rushed, etc. It makes me start getting twitchy and irritable. We are going up to the inlaws for a bbq and it starts at noon. It takes an hour to get there so we could leave at 11 and be fine. I like being early and the kids like visiting so I told Hubby we could leave earlier. This morning he says we will leave at 10:30. Well, I'm sitting here at 10:27 and I don't even know where he is. He had to get something from the store but I know he's back cuz the car's here, but I don't know where he is, probably out in the yard doing something. I can feel myself getting irritated. Oh well, I guess I'll go make sure the diaper bag is ready to go in case we ever leave. To join in SHS, go to The Lazy Organizer. So what is everyone's plans for this holiday weekend? Going anywhere, visiting family, staying home? I'm not sure if we'll be doing anything. We might go up to the inlaws tomorrow if we have gas money. And maybe we'll bbq some burgers on Monday and have a picnic, that sounds fun. You know, as much as I love Hubby, and it's nice to have him home to help with the kids, some days I enjoy him being gone lol. He took off today so he could have a 4 day weekend, and he likes to take over the computer. Now, I'm used to having the computer to myself during the day, so I get itchy when he spends 2 hrs on Ebay looking at a bazillion different printers. He is wasting my valuable blogging time! I don't know what else to do with myself when Baby and Little Baby are sleeping and Toddler doesn't need me to do anything for him. So I sat here glaring, clearing my throat, tapping my foot, and asking for MY computer back until he finally went somewhere (I don't know where but he's not at the computer and that's what matters lol). When was the last time you forgot something? What was it, and how long did it take you to remember it? - I notice my boys room needs cleaned when I step on blocks. Toddler still can't say most words right. 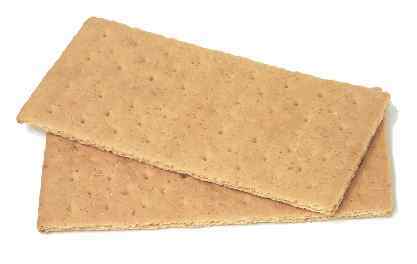 Today I gave him a handful of graham crackers which he loves. Afterwards he was yelling for more and this is how it sounded, "I want more d*** crackers!" Of course he wasn't really swearing (we don't swear here), that's just how he says it, but it had me cracking up. I love our mattress. Hubby bought it for my birthday a few years ago. I also like having a vacuum, I didn't realize how much until the belt broke a few days ago and I can't vacuum until we get it replaced. 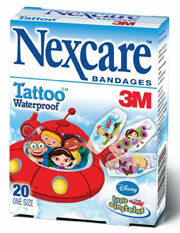 And, knock on wood, my kids haven't been sick or hurt enough to ever warrant an extra trip to the dr or ER. Here's a little update on the potty training: Toddler is doing really well today. He's already earned 10 stickers (and therefore 2 treats) and has only made a few little messes. And he's doing it without me telling him to sit on the potty, he just goes and sits on it himself. Hopefully he keeps it up! Ok, this is just really short and simple cuz I completely forgot what I was really going to write about today lol. Online bill paying is a lifesaver! Most of our bills can be paid online at the company's website, saving time and money for stamps, envelopes, etc. Plus you can check your balance, due dates, etc easily. I have all my online bill sites bookmarked for easy access and it takes about 5 minutes to pay my bills. Making life easy works for me! 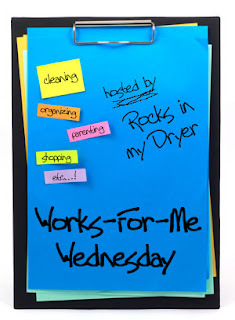 Make sure to head to Rocks In My Dryer for more great WFMW tips! Literally. Have you ever heard the term "S**t happens"? Well, evidently when you are potty training a toddler, it happens all over the floor. Toddler has not quite learned to run to the potty when he needs to go, and since we are using the bare-bottom method it was inevitable that some of his messes would be, well, messy. Today he was downstairs watching a show when I hear him say "Uh-oh". I go downstairs and he has a handful of baby wipes, trying to wipe poop off himself, smearing it on even more in the process. Then he takes a step backwards, into a pile of it and starts crying. I grab the wipes to try to clean it up when I realize there is a trail of it around the coffee table, it's all over Baby's feet because he obviously walked through it creating the trail, and there's no way wipes are going to be enough for the mes. I grab both boys and put them in the tub to spray them off, and scrubbed the carpet. I made sure not to be mad at Toddler because I don't want to make him hate potty training more, and just told him we'll try to make it to the potty next time. Now that I look back it is slightly funnier, but I must say this potty training thing is not all it's cracked up to be. Diapers are much easier! I've been reading a lot of posts about potty training lately and reading the comments and tips. So yesterday I just got it into my head to start Toddler. I decided bribery and lots of praise would work best for him, because reason sure doesn't. So I told him if he went on his potty he could get a sticker and when he gets 5 stickers he gets a sucker. I let him run around most of the day with no diaper. It started out fairly well, but by the end of the day he kept begging for a diaper. But still he went on his potty 5.5 times (the other .5 didn't quite stay in the potty) and only once on the floor. So he got 5 stickers and a sucker. Today is not going so well. He's peed on the floor twice and none in the potty. And I need some new bribes cuz he's already tired of stickers and suckers. How do you get a toddler to eat broccoli? Last night we had a dinner with broccoli mixed in and I was afraid Toddler was going to turn it down. I don't know why I automatically assumed he wouldn't like it, I guess it's just a stereotype- all kids hate broccoli right? So I set the plate down in front of him and right away he picks up a piece of broccoli and yells "Tree!" and eats it. It was his favorite part of the meal. He seemed to think it was funny that he could eat trees. Now how can I get him to like corn more? My Toddler loves to color. He's always loved it, ever since his first birthday when we got him a box of crayons. Every surface in our house has been colored on with crayon, pen, pencil, permanent marker, or any other writing utensil. We have gone through many Mr. Clean Magic Erasers (which are the greatest!). Luckily he now prefers to color on paper. 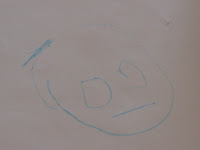 And recently he's actually started drawing things that look somewhat like what he says they are. He frequently draws Maw-maw and Paw-paw (grandma and grandpa). These people consist of a big circle for a head, 2 smaller circles for eyes, and a straight line somewhere inside for a mouth. Now he has started adding 2-3 "legs" for various animals, and many legs around the head for a spider. It's so much fun watching him color and learn. "In silence man can most readily preserve his integrity." I think this quote can go along with the saying "Better to keep your mouth shut and be thought a fool, than to open it and remove all doubt". A lot of the time online people take offense easily because they read something the wrong way. It's hard to convey expressions, sarcasm, tone, etc through typing so sometimes fights break out over something innocent. I try to be really careful about what I type so that it won't be read the wrong way. I think this can apply to real life too, many people don't think before blurting things out. Another quote that comes to mind with this is "If you can't say anything nice, don't say anything at all". This week I'm just going to add a small goal. I'm adding flossing on to my teeth brushing goal. It's a pain to floss with braces, but I really should do it more often. So I'm going to try to do it every day. I was tagged by Lorie for this meme, talking about favorite places to eat out. 1) Denny's- I've always loved Denny's. I usually order their French Toast combo, mmmm. And usually they are very family friendly. 2) Arctic Circle- this is probably my favorite fast food place. I love the burgers and shakes. I used to love the fries until they changed them. 3) Applebee's- I think I love them so much just for their Blue Ribbon Brownie, probably the yummiest brownies I've ever had. The food is pretty good too, and Hubby loves going there. 4) Wendy's- My next favorite fast food place. Yummy fries and I love the Jr Bacon Cheeseburger. I like most of the stuff on the menu and they usually have really fast service. 5) Burger King- quick and easy and just down the road. Not really my favorite food, but we go there often cuz it's the closest that we like. Also has yummy fries. On Wednesday I had an orthodontist appointment to get my braces checked and to put a few new brackets on my lower back teeth. Now my teeth are all sore from the pressure and I can't chew anything at all. I made Hubby go buy me some yogurt and pudding yesterday cuz I was starving. I really hate soft diets, I totally crave anything I can chew! I would kill to be able to sink my teeth into a hamburger right now. At least I know it will only last a few days before my mouth gets used to the change and I can eat again. Speaking of which, I need to go eat, I've only had a yogurt so far today and my tummy is telling me it's going to start eating itself soon. List 3 emotions you experienced this week. Name a car you’d love to have. Describe your typical morning routine. - Wake up, groan, try to slowly ease out of bed without waking Baby, get dressed, get a load of laundry going, turn on computer to boot up while I get my cereal, eat cereal while catching up with email and blogs and stuff. Then the day can start. Have you ever emailed someone famous? If so, who, and what did you say to them? Did they reply? Do you listen to podcasts? If so, which ones? I really love to read. I just finished re-reading The War of Light and Shadow series by Janny Wurts. Unfortunately the last book isn't set to come out for 2 more years. I also just re-read the 5th and 6th Harry Potter books. I've just started Joust by Mercedes Lackey and will read that series if I like the first book. Anyone have any recommendations for books or authors? I really like series books. I love fantasy and historical fiction and a lot of other genres. Today I am thankful for the gentleman who stopped to help me change a tire yesterday. I'd had a long bad day and the kids were not happy, Baby needed changed, I was starving, and I hadn't changed a tire since Driver's Ed 8 years ago. He truly was a blessing. It probably would've taken me at least 1/2 hr but he got it done in 5 minutes. I'm also thankful Hubby understood I was having a bad day yesterday and let me take a long hot bath in peace. I've had a busy, not-so-fun day. I didn't watch Little Baby today because his mom was sick yesterday so she stayed home half the day today then took him to work with her the rest of the day since I had an orthodontist appt. The appt went ok, I was just really tired driving back and Baby was screaming half the time. Then we stopped at the house to pick up library stuff and headed to the library. That went well, and Baby was starting to get fussy but I figured a few errands would be ok before we went home. So we went to the bank where we learned they had closed our checking account because the balance had gone to $0, so I put in some money to reopen it and they said it would be a few minutes. So I went to WalMart to get milk and juice and something for dinner. Getting Baby out of the car I realized his diaper had soaked through to his pants, but I was already getting frustrated and decided to take him in to get milk like that anyway (I forgot I had a change of clothes in the diaper bag I could've used, oh well). So I get all my stuff and go to check out. I ran my debit card, and it wouldn't work. Turns out my account won't be open until tomorrow morning. So now I have no milk or dinner and had to leave my cartload of stuff for the annoyed looking cashier to put away while I take my crying wet baby and getting-on-my-nerves Toddler back out to the car. We head home and while driving on the freeway I run over something metal and loud. I didn't see what it was but just kept driving. About 30 seconds later the car starts pulling to the right and I hear a thumping coming from the front. I had a flat tire, my first ever flat tire. I pulled over on the side of the exit ramp I was on, got out to make sure it was flat, then sat in the van crying for a few minutes. Then I called Hubby to ask where the jack and stuff was and how to get the spare out from under the van. I was working on getting that done while Baby was crying in his seat and Toddler was getting annoyed with being stuck in his. Then a very nice gentleman stopped and helped me change the tire, I was so grateful. I finally arrived home after my long busy day and decided that I had done enough for the day. Dinner was whatever anyone could find to eat, and I don't really care that the house is a mess, I'm just too tired to deal with it. Hello, me again. I think I am turning into the substitute blogger when my wife is away. Sorry, I don't have any stories about my kids because I am at work. I was just curious to know if anyone has grown grass seed before. I have been growing quite a bit of it and have come pretty good at it. I was just curious to know of anyone else's strategies if you had one. Hello friends of my wife. This is Kara's favorite husband talking here. I was hoping to get some advice about pets from someone other than Google. We have a cat that cannot seem to get the idea of going in the litter box. I have tried everything I know to train her to go in there. I have even bought a spray to spray in her usual spots to prevent her from going there and still no success. Does anyone have a good suggestion? 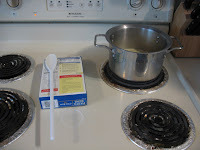 An easy, disposable drip plate and my stove and counter stay clean. For more WFMW tips, go to Rocks In My Dryer. That's it for today. Really not much to do besides take care of the kids. Michelle is coming over later to help with the garden area. Then later tonight I'll be watching her girls for a bit. I better go get started on the laundry before I forget again. Well, after such a nice weekend, it's back to usual here. The boys are being pretty good, though making a lot of messes. Toddler has already trashed his room and the living room. I need to clean up in the living room, do dishes, do some laundry, clean the boys' room, and figure out what to make for dinner, I'm getting tired of Hamburger Helper all the time but we don't have much else right now. We need to go grocery shopping soon. This has been a really nice Mother's Day. Yesterday Hubby let me sleep in while he took the boys out to breakfast and to play at the mall. Last night he gave me a dozen white roses, my favorite. Then today at church all the mothers were given a copy of "The Testaments" movie and a Symphony bar, mmm. After church Hubby gave me a very sweet card, and had even helped Toddler sign it too. And he gave me a beautiful photo album, since I don't scrapbook and have been wanting an album to store pictures in. All together this has been a great Mother's Day. I even got a little nap, the weather is beautiful and Hubby's helping with dinner.
. even though it may not have seemed so at the time. 3 years ago I celebrated my first Mother's Day, while pregnant with Toddler. I was so excited about the journey I was about to go on. I swore I would be the perfect Mother. After I had him I realized there was no perfect Mother, just every Mommy doing the best she can. 2 years ago my Mother's Day was bittersweet. I had my precious little boy but I had also just suffered a miscarriage. I now know a small bit of what those who experience infertility go through. My prayers are with them on this day, because I know how their hearts must ache. Last year I celebrated my 3rd Mother's Day, 8.5 months pregnant with Baby. I was hoping he'd come early as a Mother's Day gift to me, but he waited until he due date to decide to come. Now this year, I have my 2 precious little boys and a wonderful husband. I am so grateful for everything I have and all I have learned from being a Mother. Every day I appreciate my own Mother more. I feel bad for all the times I made her worry or angry. I am so thankful for everything she did to teach me to be who I am. Thank you Mom! I've realized that the goals that are easy to do are also easy not to do. I think I will remember them since they are so easy, but then I end up forgetting. I'm still working on making everything habits again. I'm doing pretty good with saying my prayers, and very good reading my scriptures (which I owe a lot to getting my daily scriptures emailed to me, so I just read it first thing in the morning when I check my email) and making dinner 3 weeknights a week. Everything else is off and on. I've been doing poorly at crunches and Toddler's bedtime routine and getting myself to bed. I've started to do better on everything else. This week I'm just going to continue working on my goals. I have a lot already and need to focus on making them better habits before I add more to my plate. Go to The Lazy Organizer to join in SHS. With Mother's Day coming up I'd love to hear what everyone else is getting (or giving in the case of any fathers who read this). I told Hubby what I wanted was a chance to sleep in, in peace. So we agreed that tomorrow morning when the boys get up he will take them out to McD's for breakfast and to the mall to play in the play area, so that I can sleep in without being disturbed. We can't do it Sunday cuz church is at 9, so tomorrow will be the day. I just hope the excitement of getting to sleep in won't keep me awake lol. Hubby also says he was thinking of something else he wanted to get me. He's always great at giving gifts so I'm sure whatever it is will be nice. OK, so miraculously my tomato seedlings are sprouting great, despite my Hubby's attempt to drown them and Toddler's attempt to dump them down the drain. But I really don't mind, they are just trying to help and only killed off 3-4 sprouts (thank heavens I planted 18!). But what really irks me is my dang cat. We have 3 cats and I think I only like one of them. Stars is great, cute and fluffy and cuddly. The only thing she does to bug me is chews up my hair elastics. Colors poops in the basement, trips me on the stairs and I could kill her some days, 'nough said. And then there's Stripes. I swear she purposely tries to make me angry. Maybe she's suicidal. It took her longer to learn to use the litter box, she was always pooping everywhere. She finally learned, but she still hasn't learned that it is NOT ok to jump on the table during dinner and stick her face in your food. Even Toddler has learned to yell "No cat! Down! Cat! No!" And that brings us back to the main point of this whole post. Stripes has decided I put my little seedlings on the counter for her to snack on. 3 times now she's bitten off some leaves. The first time I forgave her after a friend told me they would still be okay as long as the roots weren't damaged. The 2nd time I walked in to see leaves ripped off, I had to count to 10 then threw her in the storage room so I wouldn't kill her. Then yesterday, I walked in to catch her in the act. She saw me and froze with that deer in the headlights look. She knew I was mad. Of course me yelling "Stupid cat, I'm going to kill you!" might have clued her in. She did a mad dash off the counter, into the living room, back into the kitchen, under the table, and then upstairs finally, with me clumsily chasing her, kicking my feet, screaming, and tripping over the dang baby gate 3 times(it's between the living room and kitchen). I bet she got a good laugh out of that. So now I have to keep the blinds down, blocking them on the windowsill so she can't get to them. I swear I'll be happy if 1/2 of my seedlings make it to the day they can be planted outside, and I'm sure half of those will probably be killed by my black thumb. And you know what I'm going to do with the first tomato that grows? Throw it at that darn cat! Does anyone know why some days a Toddler can be the sweetest thing, bring things, cleaning up his toys, saying "I wuv yoo" to everyone, then the next day they turn into a raging monster?! Seriously, today he just will not obey anything I say. I say leave Little Baby alone cuz he's sleeping, next thing I know I have a screaming awake baby. I tell him to turn off the TV again because it's driving me nuts and he purposely pushes every button, except the off button (and he knows which button too, he's been doing it a long time lol). When I want him to clean up he just looks at me and whines for me to do it. Everything gets dumped out- chips, wipes, crayons, the floor is a mess. Grr, some days I want to just lock him in his room! Good things he's so cute! Luckily most days he's a sweetie, but today is not one of those days. Do all toddler's have Jeckle/Hyde personalities?! I know this has been done before but it took me a few times seeing it before I got the hint and tried it out. Using a feed reader to do my blogging has helped me so much. It takes me a lot less time to see who from my blogroll has posted and I can read it right there in my feed reader and just click over to the post if I want to comment. I use Google Reader and it was so easy to set up. Very user-friendly and simple. I know there are many other feed readers to choose from, but I don't know what they are lol. It can't hurt to at least check it out! Go to Rocks In My Dryer for more great WFMW tips! "Here and there, human nature may be great in times of trial, but generally speaking it is its weakness and not its strength that appears in a sick chamber." I thought this quote was quite fitting for me today. I think I'm pretty good at holding up in stressful times, being the rock for people to lean on, or something like that. But when I am sick, no way! I am grumpy, moody, tired, sad, and all those wonderful feelings that drive people away. I definitely show my weaknesses when I'm sick! And my boys do too, they get so fussy and annoying. Anyone else get like this? That's about all I care to do today. We are so exhausted. Last night the boys decided it would be fun to get sick and throw up all over themselves and the house. It stunk, literally. Guess they got a tummy bug or something. And my stomach's not feeling to great either :P So I'm going to take it easy today and not worry too much about my messy house. It's been a while since I've been tagged for a MEME. I finally got the 7 things one I've seen going around. Lorie tagged me. Most of the people I know have already been tagged though, so if you haven't done it yet consider yourself tagged by me :D The point is to list 7 random things about you, I think stuff you haven't mentioned on your blog before, then tag 7 people. Today I start babysitting my neighbor's baby. It should be interesting taking care of 3 kids under 3! So I probably won't be blogging much during the weekdays while he is here, I need to get used to taking care of a baby again. I ned to go change laundry around and vacuum and do dishes too. He should be here any minute. Do you want to win a cool new blog design? Go check out Everyday Mommy to enter her contest to win a new blog design. She does beautiful designs for blogs. I'd love to win a cute new layout :) You have to have a Typepad or New Blogger account to win this. I'm going to make this one short today. I'm doing good on prayers, computer time, and laundry, but can do better. Everything else, even my habits I thought were solid, hasn't been as well. For the next few weeks I'll be putting all my goals back on my Joe's Goals sheet to work on them better. I'm not even going to show this weeks, partly because it's embarrassing lol, and partly cuz I'm exhausted and need to get to bed. My new goal this week will be hopefully an easy one, since I want to focus more on my current goals. My goal will be to put my lotion on every day. I have psoriasis and so my skin is really flaky and itchy. When I use my lotion it is so much better, but lately I've only been using it a few times a week. I want to use it every day so that I will look and feel better. Check out The Lazy Organizer to join in SHS. Join in 3 weeks this month to win a really cool book. "I long to accomplish a great and noble task, but it is my chief duty to accomplish humble tasks as though they were great and noble. The world is moved along, not only by the mighty shoves of its heroes, but also by the aggregate of the tiny pushes of each honest worker." When I found this quote I automatically loved it. I think so many of us wish we could do something great to make a big impact in the world: cure cancer, build a time machine, create peace, etc. But what we need to realize is that without the small accomplishments, there would be no big accomplishments. I make a difference to the world by being a good mother to my children, a good friend to those around me, and a part of life in general. If there were no mothers taking care of their children, being there to love and teach them, life would cease to happen. Every job is important in the big picture. If there was nobody willing to collect the trash, then garbage would pile up, disease would spread, and life would be miserable for everyone. It's important to remember the quote "To the world you may be just one person, but to one person you may be the world." I doubt I'll ever accomplish anything that will be written down in history books, but to my children I am they're hero and the person they look to for support, love, and encouragement. - Hm, let's see. A rat. I despise rats, they are so disgusting. My brother had rats for pets and they were stinky and gross. - ...the days I had my boys. - I don't know if I'd want to be anyone famous lol, I'm too shy. - OK. I like shrimp and I hate steak. I'm down in Utah at my family's for the day. I had a lot of fun meeting up with the ladies from my messageboard. We met at Chuck E Cheese and let the kids all play. They had a blast. I'll be here until tomorrow, then drive home. So I won't be visiting many blogs the next two days. I'll be back around tomorrow night. I did it! I managed to finish in time! Boy that was more work than I though it would be! The space I chose to organize was my bedroom closet. I also ended up doing a little of my boys' closet as well. The plan for my closet was to go through all our clothes and purge a lot, especially from Hubby's side, he has a lot of clothes! Then I wanted to put some shelves in and baskets to organize things. So we got started by taking everything out and going through all our clothes. Through the years I have learned that less can actually be more, and I've worked on simplifying the things I have, including my wardrobe. If I don't wear it because it's old, wrong size, style not right on me, or whatever, then I get rid of it. This is a big change from how I used to be just a few years ago, I would hold onto every piece of old ratty clothes just in case I might need it in the future. Now I find it so nice to not have so much to keep boxed up, or piling on the shelves, and I also have less laundry. 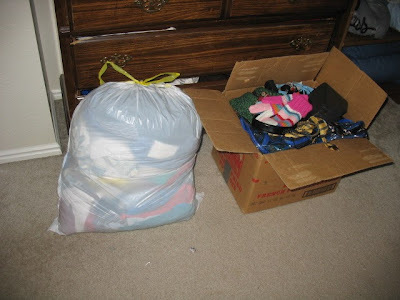 I actually got rid of about 1/2 of what was in there of mine, including several pair of shoes I never wear, and Hubby was able to part with a small pile. Of course if I'd gone through his things too I would have gotten rid of more, but I figured that would be too controlling and let him do it. In total we stuffed a garbage sack and box with clothes, shoes, ties, belts and other miscellaneous things and offered it up on freecycle. I love that there are people out there that can find a use for the things I don't need anymore, makes me feel much better about getting rid of things. So after we purged, we put everything back in until I was able to get some shelves. For a few weeks nothing happened, then I realized I was running out of time and decided to get some shelves. Freecycle to the rescue again! I was able to get 3 shelves that I cut in half to fit in my closet, and they didn't cost me a penny. For a few days nothing happened again, until today when I really had to finish lol. My good friend Michelle's husband was able to cut the shelves in half for me and gave me some scrap wood to anchor them to the walls. I could not have finished in time without their help! I spent many hours today getting my shelves in. I love to build things, but don't really have a whole lot of experience so it was quite a challenge for me. As I got started I realized my closet was not even, the width was shorter on one side, so I had to get my shelves cut again. Hubby came home, took one look, and said "Good luck." Thanks, hun. At least he was able to take the kids away so I could get them done. I finally got them in, though it's not the best build job. And I'm pretty proud of how it worked out. I also got some baskets from a thrift store and decorated them with cloth to make them look nice. I put my socks, undershirts, and other underclothes in mine on the shelves. 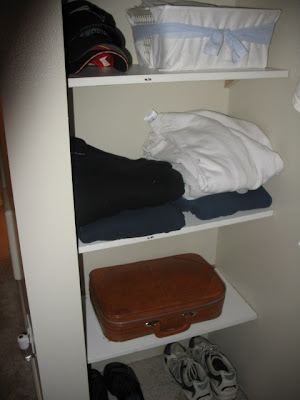 I put Hubby's white t-shirts and hats in his baskets, and put his sweaters on a shelf too. 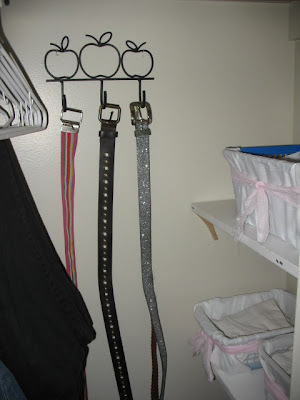 I also put up a belt holder on my side so it's easier to get to my belts. OK, enough talk, time for pictures! My stuff on the right, Hubby's on the left. Shoes and box of maternity/fat clothes (which got purged then put in storage room) on the floor. Hubby's shelves. Bottom- shoes, then suitcase with temple clothes, then sweaters, then hats and his white t-shirts in the basket. On the top shelf above that he also has a basket with gloves, hats, etc and his pants. My shelves. Shoes on bottom, then temple clothes bag, then undershirts and socks in baskets, and then underwear in basket. I have sweaters and PJ pants on the very top shelf. And my boys closet that got done in the process too lol. I bought the blue closet organizer ($2 at thrift store, gotta love it!) for my closet but it didn't look right so I decided that since I had just purged my sons' clothes and the dresser was too big now, that it would work great for there clothes, and it did! We went from overflowing dresser to organized clothes closet. - The hardest part was definitely the shelves. We couldn't afford to buy shelves so I had to find some, and thankfully freecycle came through for me. Then, we didn't have a saw to cut them in half, so we had to rely on my friend's and their neighbor to get that done. And finally, I am not skilled at carpentry so installing them all by myself, with 2 small children trying to help lol, was a big challenge. I practically gave up in frustration at some points, but I kept going and now that I did it I am so proud of myself. - Well, it hasn't been done long enough to really know the effect it will have, but it already makes me happier having the shelves and baskets in to keep it organized. It looks much better and that itself makes me happy. 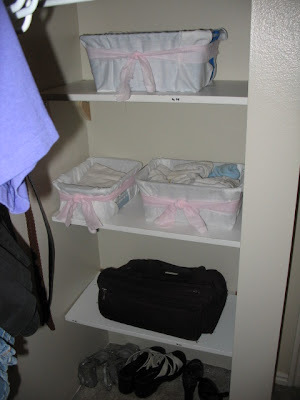 With my boys' closet I have already noticed how helpful it is to have it organized like it is, it's easier to grab clothes for them to wear, put away clothes, and see what we have. 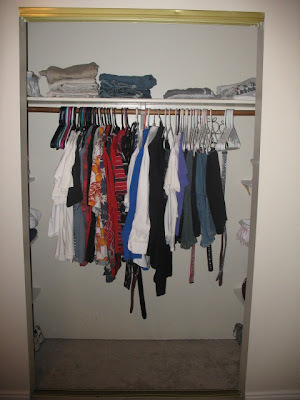 To maintain the order in both closets I will have to continue purging when we get too much. 3. What did you do with the "stuff" you were able to purge out of your newly organized space? - I offered it on my local freecycle group to see if someone else could use it. Most was still in good condition. And somebody will be coming to get them soon. It makes me happy that somebody else will be able to use them, it is much better than throwing it out and feeling like I wasted it. - Do not procrastinate building projects! It would have been much easier if I'd started the shelves earlier and not had to rush to finish it today. It wasn't as easy as I thought it would be and I could have missed the deadline, so from now on when I'm planning a big project I will not leave it until the last day. That is really hard for me (as you might tell by my avatar lol, I always procrastinate) but I'm going to do better. - Definitely. Just the sense of accomplishment I feel from completing this process helps me feel good about myself. And it releases a lot of stress, because I like things being organized and user-friendly, and now it is. And as a mom, making things stress-free and easy helps out in everyday life lol, I don't have time to be frantically searching for something to wear, or getting annoyed at the shoes that get pulled out of the closet to trip me. Keeping things organized keeps me sane, and makes me a much happier mommy. A great big thanks to Laura, the Organizing Junkie for hosting this, and to Lara and Marcia for helping her out :) I really enjoyed it and loved seeing everyone else's finished projects. I'm not in a very good mood today for some reason, just getting annoyed at everything. I hate it. I'm also trying to finish up a project for the 30 day challenge at Organizing Junkie, but can't get motivated to work on it. Maybe I need to eat some ice cream to improve my mood. Well, my birthday tip is to keep kid's parties simple. I see so many parents these days planning huge extravagant, and often very expensive, parties for their small children. They need a big expensive bakery cake, a large party room or play area rented out, tons of gifts, party favors, food for everyone, special outfits, and the list goes on. Moms on messageboards I'm on plan months in advance for their kids special day, stressing out about matching the party plates to the tablecloths, and getting specialized party favors to send home with each kid. I've known women to cry over this one little day. For me, I keep it simple. We invite our immediate family and my good friend Michelle with her girls. We don't buy a ton of presents, in fact at this age most of the presents come from the dollar store, Toddler is thrilled with a box of crayons and a new toy car, and Baby could care less. I make a boxed cake mix, and frost it myself, nothing fancy, though I write Happy Birthday *Toddler* or whoever on it. I have dollar store decorations. We open presents then eat some cake and ice cream, the kids play together with the new toys, and I send dollar store gifts off with Michelle's girls for party favors. We all have a great time and for maybe $20 total. Keeping things simple works for me! Check out Rocks In My Dryer for more WFMW birthday tips! 5 Minutes for Mom is doing another wonderful giveaway. Or giveaways to be precise. From now until Mother's Day they will be doing lots of contests to giveaway some great prizes, go check it out to get entered! And to start off they are giving away a 4Gb iPod Nano! How cool! Nothing really big going on here today. Michelle and her girls are probably coming over to play in the water later, that'll be fun :) My tomato seedlings are starting to sprout so I feel safe in preparing a garden area for them now lol. Didn't want to bother if there wasn't going to be anything to plant! I have a little flower bed I'm clearing out for it. It's supposed to get into the 80s here today, so I think we'll try to spend some time outside, it gets way hot in here by evening.